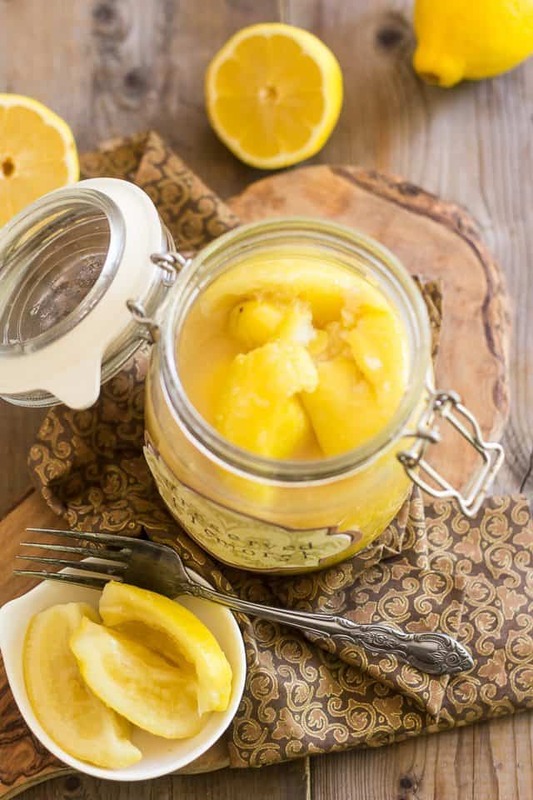 Ever tried Preserved Lemons? If you haven’t, you must! 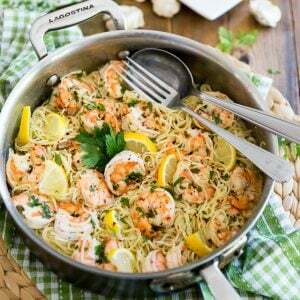 Commonly used in India and North Africa, they’re a staple of Mediterranean cuisine. They also are an absolute key ingredient in many Moroccan dishes, such as tajine, to which they add a very distinctive and tangy flavor. 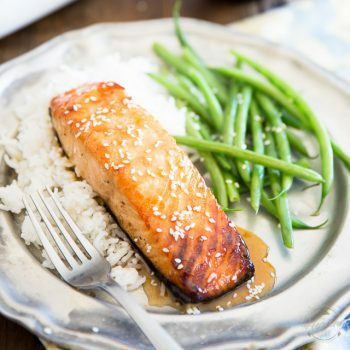 The pureed pulp makes a fantastic addition to stews and sauces, but it’s the chopped peel and rind that gets the most attention with its slightly tart and explosive lemony flavor. 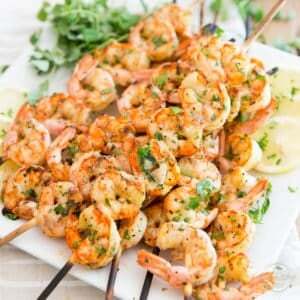 Personally, I find them especially fantastic when paired with green olives and tomatoes. 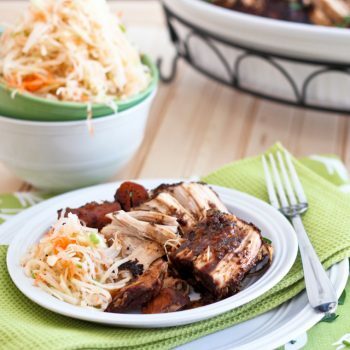 And they certainly can bring meat dishes to the next level, too! You can be sure that next time I make my Lemon & Artichoke Slow Cooker Chicken, I’ll be using preserved lemons, now that I finally have some in the fridge. Sadly, this tasty condiment can be a little hard to come across in this part of the world, and when it does make an almost miraculous appearance on the shelf of some random store, it usually comes with a rather hefty price tag. I really can’t even begin to understand why that is. They are so easy and so extremely cheap to make. Basically, all they require is a bunch of lemons, some salt, and maybe a droplet of water. Oh, and a little bit of your time, too. But not much, I swear. Lemons usually can be had for a handful of pennies a piece, so I’m not really out to break your budget with this project. You will need a total of 6 lemons (or maybe 5½ or 6½, it’s not really an exact science). So plan on spending about 6 handfuls of pennies. Oh, and before you go out and buy your lemons, check to make sure that you have plenty of good quality, additive free salt and at least one clean and not-currently-used 1-quart canning jar on hand. You back from the store already? Good! 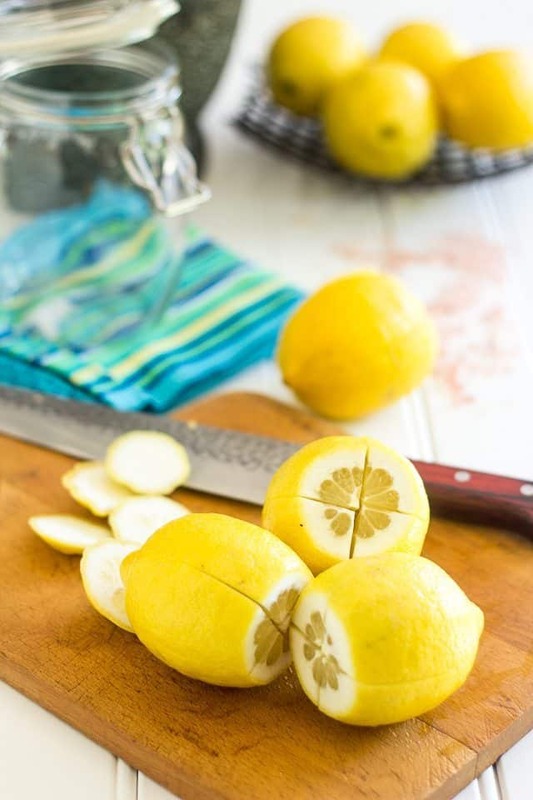 Now scrub those lemons clean under warm running water, then cut off about 1/4 of an inch off the tip of each lemon. Make a deep cross in each lemon, as if you were going to cut them into quarters lengthwise, but don’t cut all the way through. You want to stop about 1/2 an inch from the end so to keep the lemons attached at their base. 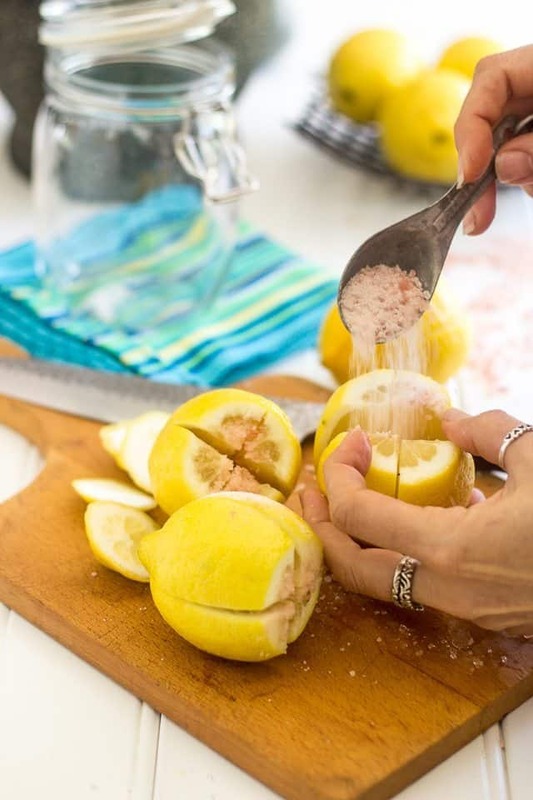 …and sprinkle about a tablespoon of salt all over the insides of the lemons. 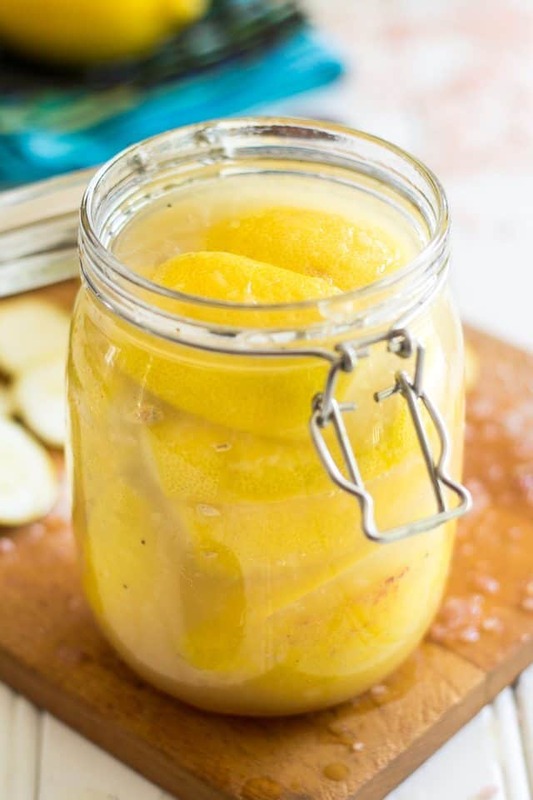 Add the the lemons to the jar, one at a time, and squish them down real good so that they release enough juice for it to eventually rise all the way to the top of the jar. Don’t be afraid to bruise the fruits here… after all, you’re going to chop them up when you use them. You really want to get them to release as much of their juices as possible. Make sure that your lemons are completely covered with lemon juice. Add more freshly squeezed lemon juice (or filtered water if no spare lemons are available) if necessary. 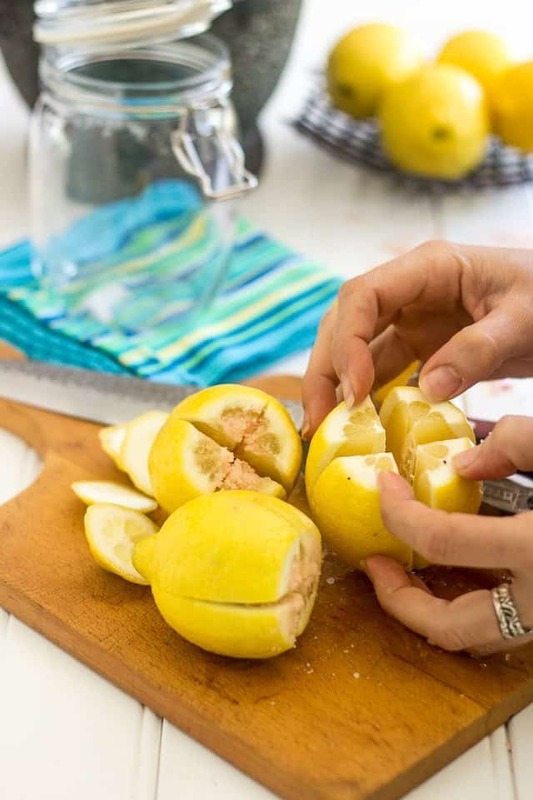 To help keep the lemons completely submerged, you may want to add a little bit of weight on top of them, such as a shot glass or any other small non-reactive object. I like to use the plastic lid of one of my spice containers; I push it down until it gets completely filled with liquid and then I position it in such a way that when I close the lid, it holds everything safely in place beneath the “water” line. 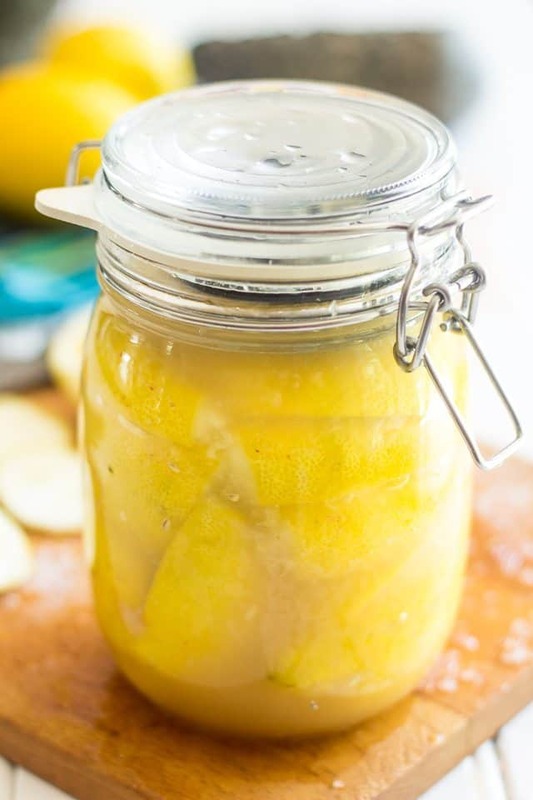 Now all that’s left to do is cover the jar loosely and let your lemons ferment at room temperature but away from direct sunlight for 10-12 days, then transfer to refrigerator. 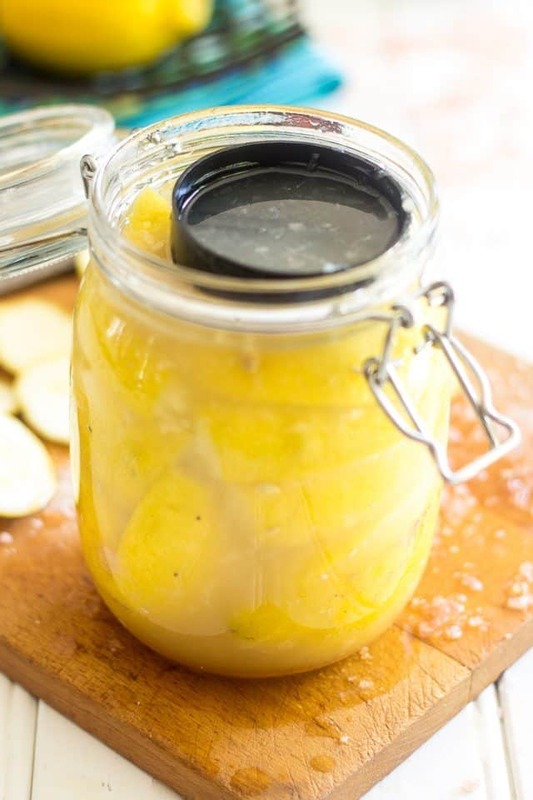 If you’re using a latch lid jar, you can either remove the rubber ring during the fermentation process or “burp” your jar every day by slightly cracking open that lid just enough to allow excess gas to escape, then latch it right back. These will keep in the refrigerator for up to 6 months, but I seriously doubt you will keep them that long. 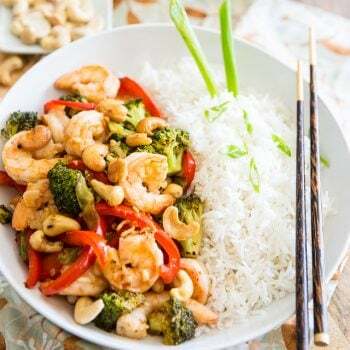 To use them, you could separate the pulp and puree it, then add a few teaspoons to your sauces and stews, or chop the peel finely then add as much or as little as you want to your favorite dishes for a serious hit of tangy, lemony taste. You can also simply chop the whole things without removing the pulp. 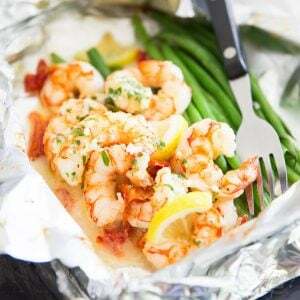 Simply cut out a piece the size that you want and chop it up, then add it to your dish. And if you don’t want to add too much salt but are looking for a real bold lemon kick, simply rinse them off before to use them! And psssst… just for fun, try adding a little bit to your mayonnaise. It’s to.die.for! 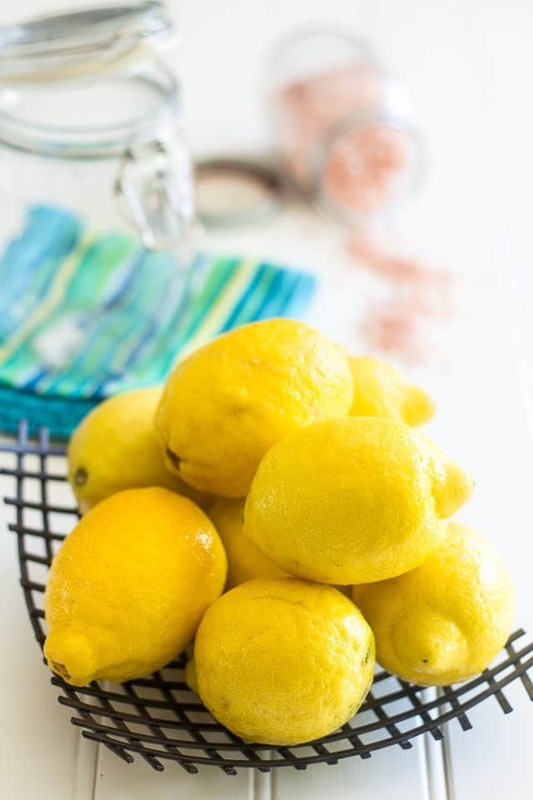 Scrub the lemons clean under warm running water, then cut off about ¼ of an inch off the tip of each lemon. Make a deep cross in each lemon, as if you were going to cut them into quarters lengthwise, but don't cut them all the way through. You want to stop about ½ an inch from the end so to keep the lemons attached at their base. Pry the lemons open with your fingers and sprinkle about a tablespoon of salt all over the insides of the lemons. Make sure the lemons are completely covered with lemon juice. Add more freshly squeezed lemon juice (or filtered water if no spare lemons are available) if necessary. Cover the jar loosely and let it ferment at room temperature for 10-12 days then transfer to refrigerator. If you're using a latch lid jar, you can either remove the rubber ring during fermentation or "burp" it every day by slightly cracking open that lid to allow excess gas to escape. 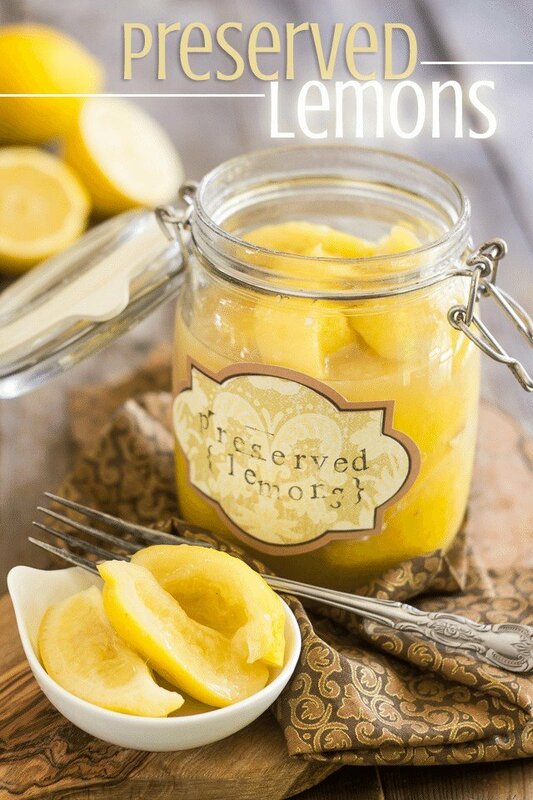 i’ve always just store bought my preserved lemons but if its easy as this i definitely will be making my own next time! thanks for the inspiration! Thanks for posting this! 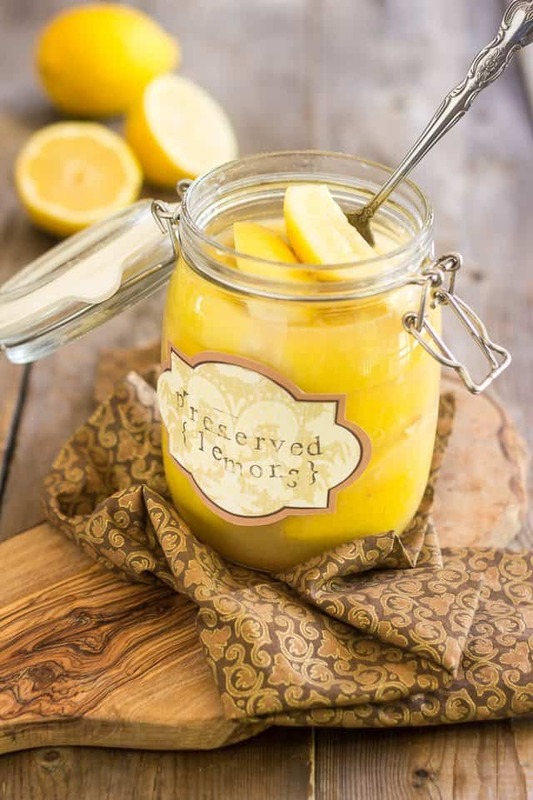 I can never find preserved lemon at any stores in my area so am going to make these tomorrow! 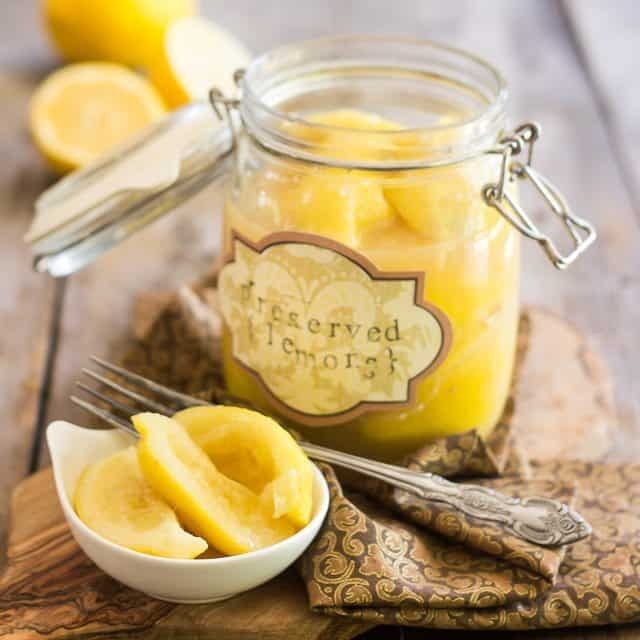 I’ve had some great desserts using preserved lemons. I’m going to have to find them and give them a whirl now that I’ve seen the preserving in action. Ooooooh! I hadn’t even thought of desserts with preserved lemons. Oh, maaaaan. I like the idea. I need to come up with something! What kinds of desserts did you have that had preserved lemons in them? Could I use them in place of lemon juice, in recipes, or for lemonade, Do they retain all the properties of lemons, might be good for cold and flu remedies. much better he hasn’t had to use his inhaler in over like 9 months. And I definitely don’t want them bringing it home to me, I’m finally starting to heal my body, and don’t want the kindergarten cooties getting to me those wonderful germs they bring home from school every year. Can you explain what you mean by “loosly cover the jar”? I tried this recipe, used a latch jar without the rubber ring and stored it in a dim pantry. When I went to put it in the fridge after 10 days, there is a ton of mould inside the jar at the surface. I will try again to make this and maybe add more water/lemon juice to make sure everything stays submerged but I am very disappointed. I’m sorry to hear, Christine… I’m ready to bet that your lemons weren’t completely submerged in lemon juice. Did you place some kind of weight on top to help keep them submerged the whole time? Also, I like to keep mine on the counter so I can keep a close eye on them and make sure that the lemon juice always rises above the lemons. I had a sake cup inside the jar to keep them submerged, but I didn’t check on it over the 10 days so it might have shifted. I’ll try again. I wanted to make this so I can follow your Creamed Spinach recipe, but i also burned the butter when i tried to make ghee so I could just be kitchen cursed. Hopefully attempt 2 will go better, I want to make this recipe for Thanksgiving! I bought a big kg size Himalayan salt because of it’s health benefits. I’m so glad you use it in your recipe! I really couldn’t see why not, Sharon! I might even have to give it a try myself! I made preserved lemons for drinking a few summers ago and it used a teaspoon of salt for each lemon. 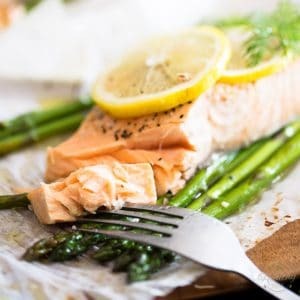 At times I found it rather “salt heavy” so I’m wondering about all the salt in your recipe; is Himalayan salt less salty? For drinking? 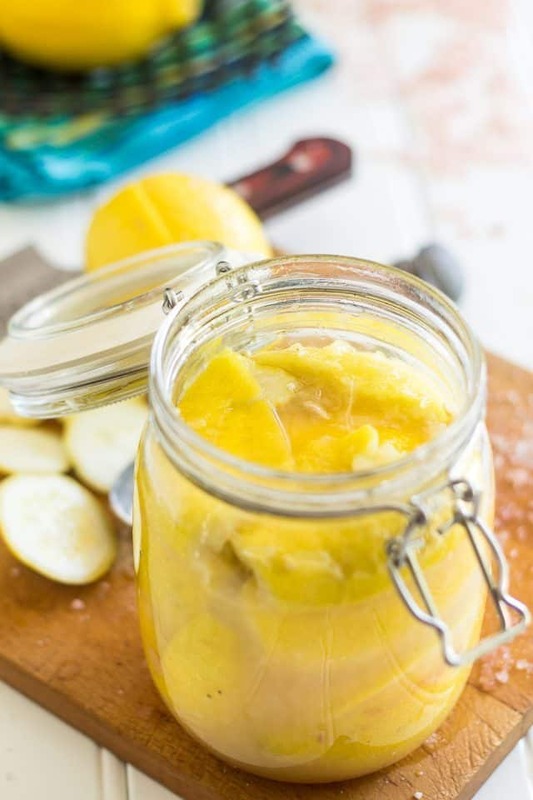 I think preserved lemons would be rather salty for drinking… You’d have to use very little and dilute it with lots of liquid! Is that something you’d read about somewhere? To answer your question, Himalayan Salt is not really less salty. It’s only better for you and doesn’t have the sulfurous after taste that regular table salt has. It’s very similar to sea salt, I’d say. Hope this helps! I use sea salt always. Yes drinking! So refreshing in the summer months! I made pitches of it a couple years now. I’m curious! I may need to give this a try… Thanks for the info! Perhaps try it with lemons preserved with only a teaspoon in each lemon as she directs in her recipe? Another thought, if you can do limes, lemons what about oranges and grapefruit? Might make a really delicious drink! I believe your lemons have to be an acidic variety (Meyer lemons are too low in acid) and you shouldn’t add water, only lemon juice. 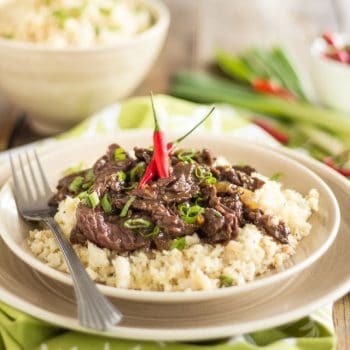 I haven’t found another recipe that suggests topping with water- where did you get that from, if you don’t mind me asking? Meyer lemons will work just as well, and filtered water should be added only in the event that there wasn’t enough juice to completely cover the lemons. If there is enough, then no water is needed. I know they can’t be healthy but OMG they are delicious!